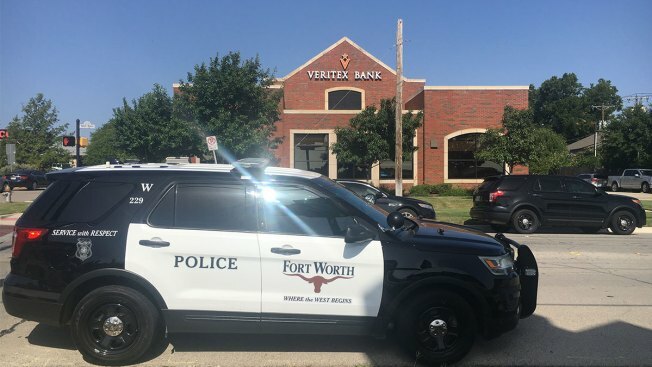 Two people have been arested by police after three women were injured during an attempted bank robbery in Fort Worth Thursday morning, the FBI says. FBI Dallas Special Agent in Charge Eric Jackson confirmed the attempted robbery during a news conference Thursday afternoon and said a vehicle seen at the bank during the robbery led them to a home on Blackmore Avenue in Fort Worth, where three people were detained for questioning. Investigators later confirmed that only one of those three people were involved. A second suspect was arrested by the FBI and Fort Worth Police on Friday. Fort Worth police are not releasing the names of the people arrested while the investigation is on-going. They also will not release surveillance video as there is no threat to the public at this point. Earlier on Thursday, Fort Worth Police Sgt. Chris Britt said at least two people entered the Veritex Bank on the 2400 block of Merrick Street at about 9:20 a.m. and shot three employees, all women. Investigators have not yet determined what prompted the armed robbers to begin shooting, though Jackson said Thursday afternoon no money was taken in the attempt. The injured women were all hospitalized in serious condition, though their injuries were not considered life-threatening. NBC5 spoke with the mother of one victim who said her daughter was in surgery but was expected to be OK.
Bank management released a statement asking for prayers for all three injured employees. About two hours after the shooting, Fort Worth police's SWAT and Special Response Team assisted the FBI in surrounding a home on the 5700 block of Blackmore Avenue and evacuated surrounding houses. The FBI confirmed a vehicle description from the bank led them to the home. "They said you’re going to have to evacuate because you’ll be in danger if you stay here," said neighbor Alvora Meeks. She spent several hours in her daughter-in-law's house up the street, but only after police carefully searched that home. "They went in my closets and the shower and went up under the carport, checked up under the cars," said neighbor Debbie Meeks. Police eventually obtained a search warrant to go into the house they had surrounded and found there was no one inside. However, investigators did detain three people in the area and took them in for questioning about the shooting. Two were later released by police. NBC 5 spoke to one of the three people detained Thursday night. A squad car dropped him off at the house on Blackmore Avenue and he was still wearing an orange jumpsuit. The man told NBC 5 he had been cleared but that at least one person connected to that house remains in custody. Britt said Fort Worth police would be assisting the FBI in gathering evidence from the home. Thursday evening, investigators took out several bags of evidence. They also towed the vehicle away for evidence that had led them to the house. Neighbors have known the family that lives there for years. They say a son in his 20s was one of the people detained. "As he was growing up, he was a good child," said Meeks. "His mother taught him well, his father taught him well. He's in a Christian home and I was shocked that something like this would happen." "This is devastating," added neighbor Frances K. Holmes Pickney. "I'm just really prayerful for everyone that has been involved, especially the ladies at the bank, for their families." Closer to the bank, investigators are looking for witnesses who may have seen anything unusual near the intersection of Camp Bowie Boulevard and Merrick Street, including one or more people running from the bank. Anyone with information that may help the investigation is asked to call the Fort Worth Police Department. Police are looking at security cameras to get a better idea of what took place inside the bank and hopefully come away with an accurate description of who shot the women. The FBI is has taken the lead in the investigation since the shooting took place inside a bank. According to FBI statistics, violence in a bank robbery is very rare. In 2016, only 3 percent of bank robberies included violence, or 146 out of 4,251 reported robberies. Only 43 of those robberies, or 1 percent, involved firing a weapon. NBC 5's Maria Guerrero, Jack Highberger, Eline de Bruijn, Charles Nichelson and Cody Lillich contributed to this report. Check back and refresh this page for updates.